Absentmindedly and unintentionally, you step into the bathroom to put up some freshly folded towels just as your daughter exits the shower. Her eyes widen. She quickly wraps the towel around herself. But you’ve already seen what she’s trying to conceal. – Scars and partially healed wounds. The look in her eyes combined with your observations and her apparent wish to hide the evidence only adds to that sinking feeling in your gut. She’s intentionally injuring herself! – What now? As a parent, although you try to prepare yourself for guiding your child through many ups and downs in life, the discovery that they’re injuring themselves can be mind-blowing. Dozens of questions swimming around in your mind: What does it mean? Is your child trying to kill themselves? What can you do? What should you say? How could this happen? Obviously, if your child self-injures, they need help. In order to provide it, you must first understand the mechanism behind the behavior. More and more, teens are under extreme stress. In particular, girls (more so than boys) feel enormous inward pressure to be smart, attractive, well-liked, stylish, and thin. The expectations of others for them to get into a good college, establish a well-paying career, and not let people down add pressure from the outside. In this stressful environment, they easily become burned out and lose enjoyment in school and other activities that they once loved. As the external pressures begin crushing them, they lack the internal emotional development to know how to cope with it. Cutting offers a seemingly easy way to relieve that pressure. Yes, as strange as it may sound, it “cures” emotional pain with physical pain. In other words, self-injury is a coping mechanism to regulate overwhelming feelings because it allows a very small part of a teen’s life to be under their power and control. Cutting lets them express painful feelings—anger, sadness—that are otherwise difficult for them to express in words. Lamentably, ever bigger numbers of teens turn to self-injury because they simply don’t have the opportunity or support to fully explore and learn better coping behaviors in challenging circumstances. Thus, the combination of far too much stress and little time for healthy teenage development lies at the core of the self-injury mechanism. While it’s scary and confusing to think that your child purposely self-injures, it’s unlikely that they’re trying to kill themselves. So, first and foremost, try not to overreact when you discover the problem. Cutting is a symptom of their core pain. Hence, to begin helping your teen to employ healthier coping behavior when under stress, you need to understand their stress level, emotional developmental stage, and their stress sensitivity. As parents, you most likely knew teens who managed problems badly or you may even made poor coping choices yourself when you were young, such as turning to alcohol, drugs, reckless driving, or other risky behaviors. We all make mistakes. Though, rather than dwelling on the possibility of a bad example or faulty parenting, focus on how good parenting can help your child in their recovery and finding a more balanced and healthy way to cope with their stress. Believe it or not, understanding from parents is a major element of support that leads to recovery, since teens who cut often feel their parents don’t understand it all and, therefore, keep their behavior secret. If they feel reluctant to talk, suggest that they write out their feelings in a journal. Ask them to not only focus on the pain and their failings but also on their strengths. Encourage them to recognize their positive traits and write at least three things down they like about themselves. 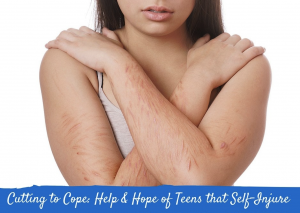 And finally, seriously consider finding a therapist who understands the issue of self-injury and can help guide your teen to employ healthier coping mechanisms. Certainly, you would agree that your child’s health is worth all the effort.